Aims and Scope. 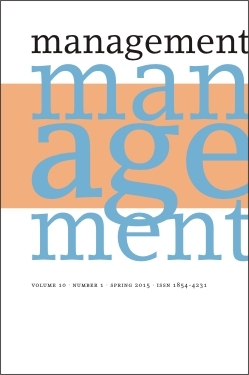 The journal Management is intended for managers, researchers, students and scholars, who develop skills and put into practice knowledge on organisation management. The journal Management integrates practitioners', behavioural and legal aspects of management. It is dedicated to publishing articles on activities and issues within organisations, their structure and resources. It advocates the freedom of thought and creativity and it acknowledges differences in the value system, interests, opinions and attitudes. It promotes the ethics in decision-making, moral responsibility and lawfulness of activities. The Journal is supported by the Slovenian Research Agency. The Journal is archived by the National and University Library of Slovenia. Creative Commons CC BY-NC-ND 4.0 License. No article submission or article processing fees are charged.